In my opinion the colors of the prism are a good topic because they fall into the domain of common knowledge, but also correlate with the wave lengths of the visible light and other electromagnetic radiation (e.g. infrared –> ultraviolet). 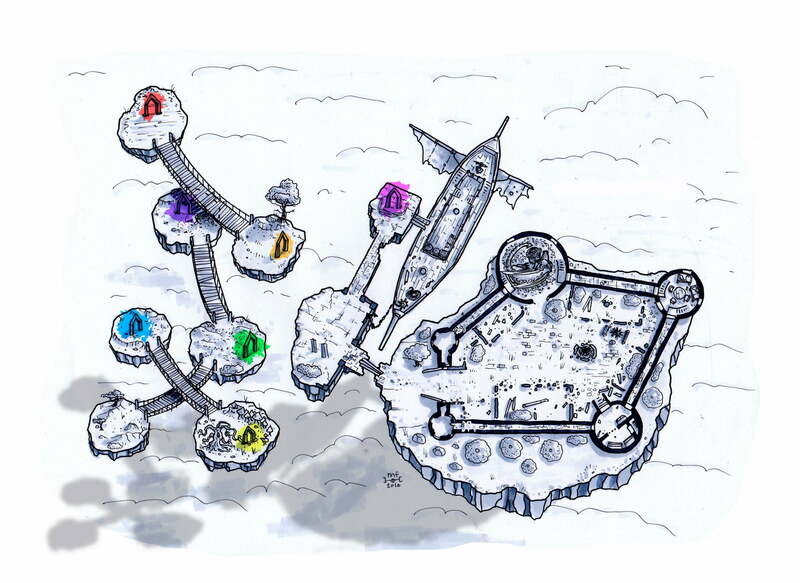 The adventure this map is designed for (the adventure itself is not finalized yet) has two bigger challenges: the prismatic portals and activating the teleportal back home. The characters come through the red portal and they glow with a red aura. The players need to figure out that when the character glows with a certain color, they can go through the short range local teleportal with the next color in order. The order is the same as in a rainbow – or a prism. The map shows the route the characters need to go to pass all the prismatic portals in the correct order and find their way to the castle. 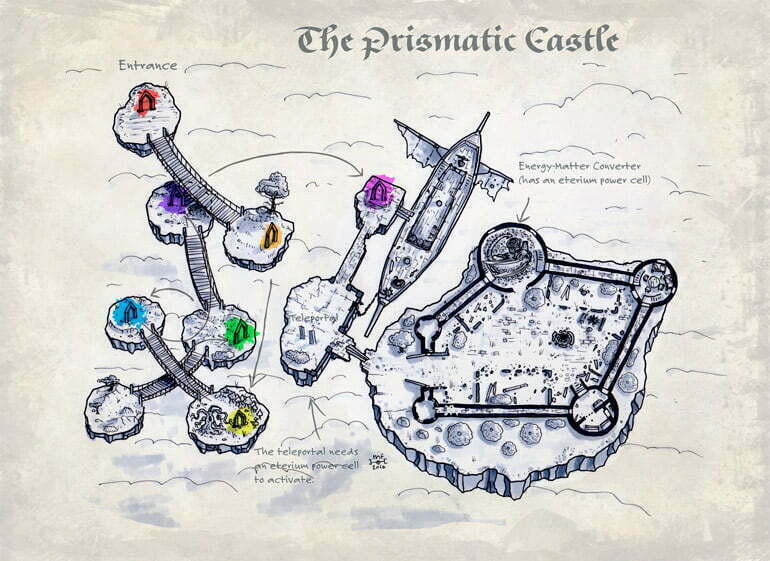 As the characters are explore the prismatic portals, they probably find the long-range teleportal. As soon as they reach it, they’ll find out that it’s offline because of a power shortage. They could get it running by switching its power supply… if they just can find one. Well, of course there is one space power cell nearby. The only problem is that a dragon has it. A dragon has built its nest inside one of the towers of the ruined castle. It has found an energy-matter converter (also know as “replicator”) that can produce the following materials out of thin air: tin, copper, zinc, lead, vanilla ice cream and minced meat (It tastes like chicken). the replicator has a working eterium power cell that could power up the teleportal. The dragon is lying over a huge pile of scrap metal bits and its sleeping when the characters arrive. It will wake up if there are any loud noises. To make things even more complicated, there is a bunch of skypirates marooned on the island. They are hiding in the castle, trying to avoid the dragon as well as they can. There are three skypirates left on the island: Jack the Wolf, Dice-Willy and Little-Mike. The skypirates came with the ship that is docked next to the castle, but it’s wrecked beyond repair. The marooned skypirates are likely even more desperate than the characters and they are willing to make some sort of deal to bring the teleportal back online and get off the island. The problem is that one of the skypirates is color blind (Jack) and the rest are not that smart. They might end up causing more trouble than it is necessary. This map was originally published on Patreon with the support of my awesome patrons in February 2016.